The US market & dollar are clearly a challenge for the contrarian beast lurking in so many value investors. But the pain of contrarianism shouldn’t be under-estimated – sometimes it’s not even about losses, it’s simply the pain of being left in the dust! And people often forget the unrelenting psychic cost – everybody hates a Cassandra when the markets are booming, then hates them even more for being right when the markets actually crash! Frankly, at this point, it seems more than sensible to assume we’ll see continued US market momentum this year. Well, until we don’t…the near-universal belief in US large-caps & the dollar certainly sows the seeds of its eventual destruction! As for Europe, any kind of positive 2014 return (however small) was a pleasant & surprising blessing in the face of continued German intransigence & ECB inaction. But surely now we’ve reached an inflection point, with at least $1.3 trillion of fresh liquidity being unleashed over the next 20 months. Go on, check the indices, you’ll see a highly visible impact & response: Europe has actually out-performed the US by over 9% year-to-date! [In fact, the S&P’s down 1.7% YTD]. Wow, doesn’t really feel like that to me…how about you? At this point, the UK’s too hard to call…which suggests it’s a good time for some technicals! As I’ve highlighted before (see the end of my H1 review), the FTSE is once again knocking on a hugely important 6,840-95 (& also 6,930) resistance zone – I suspect a break here might herald a decisive change/improvement in investor sentiment, and a potentially massive surge in the UK market. 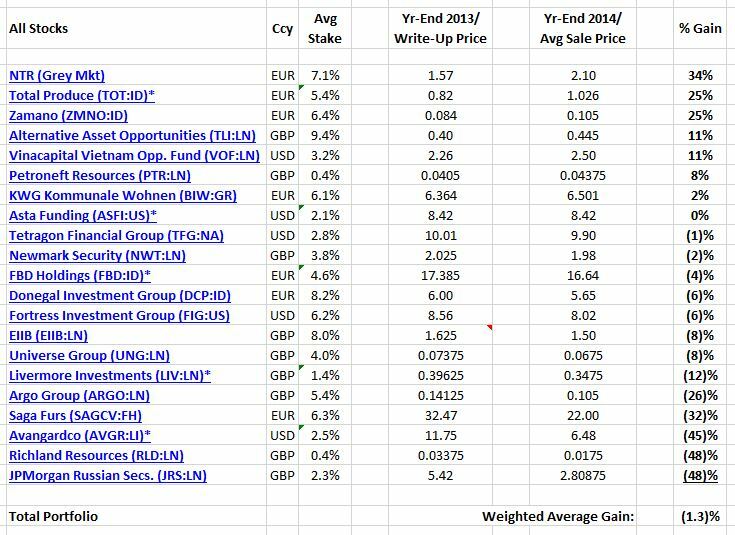 So, a 2014 weighted average loss of (1.3)% for the Wexboy Portfolio? Surely any fool in my situation should have been laser-focused on buying the Irish & US markets? Instead, I pretty much chose to do the exact opposite! [OK, not quite: i) I actually did buy/hold significant US stocks/assets, but it was mostly indirectly (rather than via US-listed stocks), and ii) while I limited my overall exposure to the Irish market, I still maintained a massively over-weight position when you realise Ireland amounts to a mere 0.3% of global GDP]. Ironically, this is actually a fairly typical example of how painful & frustrating observing traditional investing dictums (avoid over-valued markets & home bias) can often prove to be…something you get to enjoy learning from real life, not from books. Somewhat surprisingly, I can let out a wee sigh of relief here – in absolute terms, my portfolio loss is pretty minor, while in relative terms I’m always braced for a divergent year like 2014. While the hit ratio for my winners looks pretty woeful (just under 40%), the weighting of my holdings fortunately offset most of the damage. [Average holding for my top 5 winners was 6.3%, almost double the average 3.4% holding for my top 5 losers]. Recalculating for an equally-weighted portfolio, my 2014 loss would have ended up at (6.3)% instead. And things could have been much worse… I have a major portfolio exposure to UK LSE & AIM-listed stocks (no, not the skeevy junior resource/blue sky end of AIM…well, mostly! ), and to emerging markets/stocks (albeit, indirectly). Emerging markets delivered a (1.8)% loss in 2014, the FTSE 100 ended the year with a (2.7)% loss, while the AIM All-Share index suffered a disastrous (17.5)% loss. [And for investors primarily focused on AIM, it probably feels even more painful – at this point, it’s officially in a bear market, having declined a cumulative (23.7)% vs. its Mar-2014 high]. Of course, I could justify including the AIM & MSCI Emerging Markets indices in my benchmark, but let’s try resist that brand new temptation… After all, for most readers/investors, a normal frame of reference is obviously one or more large-cap developed market indices – for them, departing from that universe into what most would perceive as riskier small/micro-caps & emerging markets implies/demands a strong expectation of superior returns…which clearly didn’t happen last year! Therefore (in the absence of some highly-specific mandate), I’d concede my current index choices continue to serve nicely as both a benchmark, and as an appropriate hurdle for my investment/diversification alternatives. NTR plc (Grey Market): Since my write-up, NTR announced it was exploring a sale of its US wind farms, appointed Marathon Capital to formally launch a sale process, and confirmed its intention to provide significant liquidity to shareholders (presuming a satisfactory sale outcome). Despite all this progress, which should ultimately lead to a full unlocking of NTR’s underlying intrinsic value, the shares have languished somewhat since their Sep-2014 high of EUR 2.60. [I’d also highlight the dollar’s recent strength, which should significantly increase my target price range & fair value (all else being equal)]. It shouldn’t be too long now before we can expect to see a progress report, or an actual sale announcement. Total Produce (TOT:ID): Sold. [btw Here’s my very first TOT write-up, just over 3 years ago now…when it was trading at just EUR 0.39!] The huge value gap that existed here has now been closed – some upside potential remains, but not enough to keep me invested. And I don’t see that changing any time soon, noting management’s poor record in terms of earnings growth & capital allocation. However, a potential re-merger with Fyffes (FFY:ID) is a potential wild card here…although this has been talked about for years, and I suspect it would actually require the threat of an activist/acquirer to make it happen. Zamano (ZMNO:ID): Tsk tsk, I should be bloody delirious about my 2014 gain here… But it basically occurred in a single post-investment write-up surge last May, so it feels like old news, with the share price treading water since (well short of my fair value target)! [How complacent & entitled we often feel with our winners, eh..?!] Despite an encouraging IMS, Zamano continues to feel like a permanently neglected stock…but there’s a number of obvious paths to value here, as I detailed in my original write-up. Meanwhile, if you take ZMNO’s current EUR 10.9 million market cap & annualise its most recent results, shareholders are being rewarded with a 16.0% return on investment (almost 22% on an ex-cash basis). Alternative Asset Opportunities (TLI:LN): Despite the continued life expectancy adjustments in the portfolio (what are these people, bloody vampires?! ), I think it’s now safe to say we’ve reached a veritable sweet spot with this non-correlated investment. There’s no longer any financial risk to the portfolio, the share price continues to trade at an NAV discount, our petites morts are beginning to accelerate, management’s begun to return capital (unfortunately, they’re neglecting to repurchase shares), the dollar rally adds a nice tail-wind, and a renewed decline in yields (10 yr UST’s now at 1.74%!) should finally attract yield whores investors into the US traded life market (and/or compress valuation discount rates). VinaCapital Vietnam Opportunity Fund (VOF:LN): Vietnam now appears to have a decent handle on its inflation & banking sector NPL/capitalisation issues. The market’s priced on a reasonable multiple, and there’s a compelling growth path ahead of Vietnam, both in terms of its domestic economy & its export potential. If you’re afraid to make a China bet today, or you missed making a big China bet over the past decade or two, Vietnam is perhaps the easy alternative! Like most frontier markets, a multi-asset fund (listed/OTC equities, private equity & property) like VOF is probably the best investment vehicle – it trades on a 23.5% NAV discount, has a good performance record, and management continues to actively repurchase shares (spending a cumulative USD 198 million & retiring 30% of its outstanding share count!). Livermore Investments Group (LIV:LN): Sold. This was a hugely rewarding position, but with my increasing stake in Tetragon Financial Group (TFG:NA) (which also invests in CLO residual equity tranches), Livermore became a less compelling/non-core investment. It continues to trade on a huge 37% NAV discount, but the specialised nature of the portfolio & management’s dominant stake in the company are a deterrent for most investors. This management stake wasn’t actually much of an issue, historically, but egregious 2013 compensation & losses on Babylon (BBYL:IT) (a related-party company) now leave a bad taste in the mouth. Argo Group (ARGO:LN): Argo’s share price is now revisiting 5-year lows… Obviously, frustrated shareholders have (understandably) concluded ARGO’s a permanent value trap, and its illiquidity has exacerbated the share price decline as they’ve exited. But I’d have to disagree ARGO is a value trap…at least in financial terms. In the past 2 years, investments increased by 10% to 19.3 million, cash remains stable at 4.7 million (inc. a subsequent 2.4 million receipt of TAF/ASSF management fees), while the asset management business also remains profitable on an underlying basis. Saga Furs (SAGCV:FH): In my 2013 investment write-up, I presented Saga Furs as a totally unique investment opportunity – a stock that encompassed three of my favourite things: Luxury goods, auction houses & emerging/frontier markets. 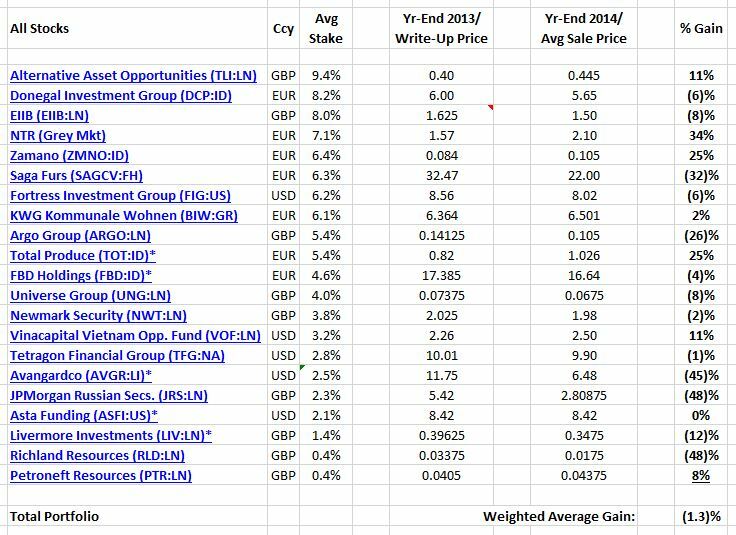 I also highlighted the multiples for both luxury goods & auction houses, which nicely illustrated the potential upside for Saga. While I believe both sectors are secular growth stories, I’m well aware they’re also pretty savage cyclicals along the way – I tried to incorporate this into my Saga valuation (looking back at average margins), and I also included a health warning. But I certainly wasn’t expecting their trade buyers to suddenly disappear, fur prices to reverse sharply, China to clamp down on luxury gifts/advertising, and Russia to become a sanctioned pariah state. [Of course, the luxury goods companies are also dealing with some of the same issues]. Fortunately, I did consider some stress-testing in my analysis – noting Saga was a financially strong company, it had produced an average adjusted operating margin (inc. financial income) of 24.2% over a 7 year cycle, its adjusted operating margin barely turned negative (1.4%) in 2009 (despite a 39% drop in sales), and the company’s actually been around for 75 years plus! In reality, luxury goods companies & auction houses – like most cyclicals – present the greatest upside when the numbers look horrible & valuations look ridiculously expensive…which can make them incredibly difficult to buy. Effectively, with Saga, I only discovered this after buying it..! A mixed blessing, indeed – I’m now sitting on a significant loss, but at least I own a stock (which I very much want to hold for the long-term) that might otherwise have proved very bloody difficult to buy ever since. [A self-serving argument, maybe – but if you’ve ever agonised over the right time & price to buy Sotheby’s (BID:US), for example, you’ll know exactly what I mean]. Avangardco (AVGR:LI): Sold. Sentiment/momentum can trump value for a v long time, especially when it involves a Russian military intervention/stealth invasion/annexation/call it what you will… I’d like to claim I exited AVGR on the Russian news, but no…I didn’t. Which is pretty dumb, since there’s a simple rule for any kind of unexpected military/government action: Sell first, ask questions later! Because at that point, you really haven’t a bull’s notion what impact such an event may have, or how long it may last (days, or years?!). And even if it ultimately proves inconsequential, you have no idea how aggressively the market will discount all sorts of potential & related risks in the interim. What finally put the scare up me was AVGR’s failure to rally on its dividend declaration* – apparently a small event, but I’d expected it to be disproportionately significant in terms of investors’ sentiment & ongoing doubts about the company). The subsequent technicals/price action then prompted me to pull the trigger & sell. Richland Resources (RLD:LN): This was perhaps my first serious effort at demonstrating to readers how useful a value perspective can be when it comes to selecting a junior resource stock with both a reassuring margin of safety & attractive upside potential. Of course, what I was really trying to do was prove any notion of value is utter twaddle when it comes to junior resource stocks… Because buying a junior in a resource bear market is much like taking a shower in a sand storm, a pointless & unpleasant experience – I recently expanded on this here. Incidentally, I realised a very rapid & chunky profit on part of my position originally – of course, that’s been more than lost since. Again, when you encounter unexpected government action (& inaction), just sell… Why I still own this tiny carbuncle, I can’t explain – other than to helpfully illustrate you can always lose more money on a busted position! JPMorgan Russian Securities (JRS:LN): I’ve mostly tried to avoid writing about country/regional funds on this blog. After all, what exactly do you write? Fund analysis is a simple affair, but no matter how many words/graphs you pile on, what are you hoping to achieve with your macro analysis…I can’t help assuming readers either agree with me already & know all the basic facts & figures, or else it’s a country/region they wouldn’t dream of touching with a barge-pole. I played it smart with VOF:LN (see above) – I kept my write-up short & sweet, focusing mainly on the market’s technicals & a few fund facts. But then it all went to my head, and a few months later I launched into a two-part From Russia With Love post (here & here), culminating in a JRS position/recommendation. However, there’s one more simple rule to contemplate here: Always buy last year’s worst-performing market. Sounds easy & makes perfect sense on paper, eh? Yeah well, now that market is Russia…so what you gonna do?! What are your performances for early 2015 ? Well, I’m feeling good about my portfolio so far..! Emphasis on Europe vs. US (ignoring currency) has certainly been the more rewarding strategy this year. I’ll be taking a closer look at the end of H1. Excited about the results. Thanks for the review. Cundhill strategy might work, but I’m still too cautious to invest in Greece just yet. Always enjoy reading your blog for its insights and irreverence. Your figure in the table for FBD year end 2014 looks a bit high. I thought it tanked last year. 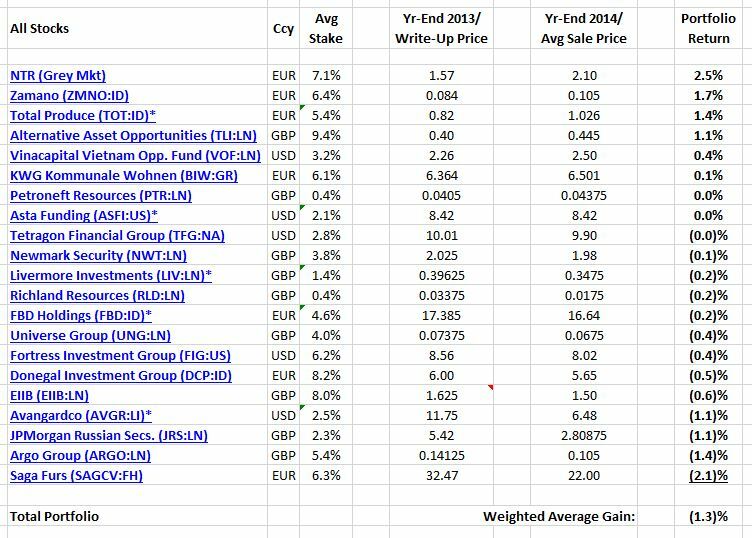 Thanks Niall – note FBD is starred*, it’s one of the holdings I exited completely during the year. The price you see here is the average sales price(s) at the time of my sales disclosure(s). Very nice reaction to NWT’s half year results today! Yes, sounds like a Cundill strategy to me. I’m sure there’s plenty of interesting pickings in the European markets you mention – plus, um…Greece, which is falling off a cliff again this year! ?